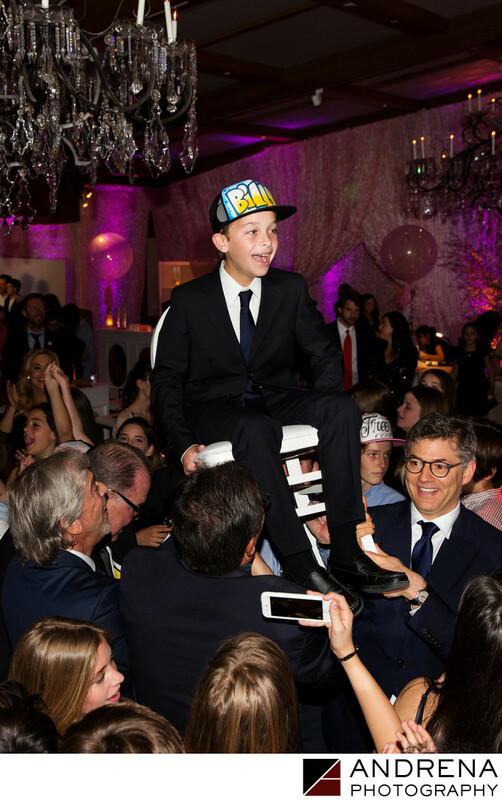 While it is definitely Jewish tradition to honor the Bar or Bat Mitzvah kid on her big night by raising her up in a chair for all to see, our photographers made sure this little brother at a Hillcrest Country Club mitzvah event party got his time in the spotlight, too. We love photographing the families of Bar and Bat Mitzvah children being duly honored for the love and support they offer their siblings and children throughout all the studying and preparation for the momentous day. It's wonderful that all members of the family and their closest community members can participate in such an outward expression of joy in the accomplishment of their loved one.